Violet’s life was absolutely fascinating and I was instantly drawn in to her plight. From the age of 12, Violet had been trained as a surrogate. She learned how to live life among the royalty and how to control the auguries – strange powers that, when used, caused immense pain and bleeding. At the age of 16, Violet was considered ready to leave to become a surrogate and she was auctioned off to the highest bidder. Her life was no longer her own – and her new life was a strange mix of comfort and misery. This dichotomy summed up her existence – on the one hand, Violet had access to anything she might want or need, but on the other hand, she ONLY had access to what her strangely erratic owner wanted to provide. Then, of course, there was the fact that she was going to be forced to bear another woman’s child. The relationships among the surrogates were really interesting as well. All of these elements blended together to make an incredibly intriguing story! I didn’t realize that this book was going to include a magical element, so I was pleasantly surprised to learn about the auguries. I don’t want to spoil too much about them, but I WILL say that Violet’s powers were incredibly impressive and that I enjoyed watching her develop them. Violet had a great combination of strength and submission – something that was probably pretty necessary in order to survive her situation. I loved her loyalty and love for her friends, especially her best friend Raven. It was easy to be sympathetic to Violet’s plight because she was an extremely likable main character thrown into extraordinary circumstances. While I didn’t find the insta-love too terribly egregious at first (I could buy that Violet and Ash had an initial instant connection based on their unusual circumstances and the things they had in common), everything moved very fast from there. There actually isn’t even a hint of the romance in the first half of the book. And I could have bought the relationship if we’d seen a bit more interaction between the couple before they started making “I can’t live without you” sort of declarations, but it didn’t work that way. It wasn’t the worst instalove that I’ve ever seen (by far), and Ewing did manage to make me invested enough to root for Violet and Ash, though – so I guess that’s saying something. Lack of details in worldbuilding. There were areas of the worldbuilding that confused me with this book. For instance, I could never quite figure out if the book was supposed to be taking place in some sort of fantasy world or if the setting was a future version of Earth after the ocean has somehow engulfed much of the land. The style of dress and some other elements made the book feel like it took place in the past (women wearing dresses, the monarchy, etc), but then there were cars and (I think) electricity – my best guess is that this is a future dystopia, but even after reading the entire book, I can’t be sure. Likewise, I was also a bit fuzzy on what exactly the auguries were – powers that the surrogates had. About halfway through the book there is finally some explanation given about what they are and why they are helpful and/or necessary for surrogacy, but I was really feeling like I was missing something by then. (So, when you read the book, just be aware that an explanation IS coming). But I still wanted to know more! Hopefully we’ll get even more details in the next book. 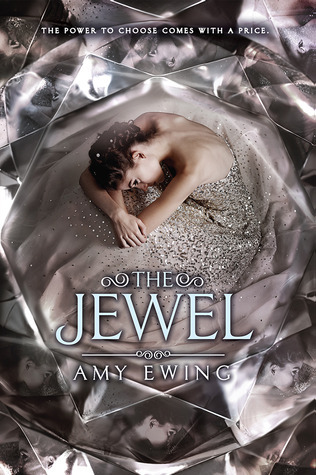 Sign into Goodreads to see if any of your friends have read The Jewel.